The name Wale Adenuga, is one name that cannot easily be forgotten in the lips of many Nigerians especially in the entertainment industry as he has been able to provide various platforms for some A-list stars who are making wave in the Nollywood industry today. Popularly known for his popular family soap opera, 'Papa Ajasco,' Wale Adenuga has been able to carve a niche for himself with the various range of production he has been able to create and also his ability to educate his children how good managerial skills which is actually paying off. Since putting his son on board his company in 2007, Wale Adenuga jnr, along with his younger ones have been able to strategically help build on the foundations their father had laid and things are turning out fine as they should. Though nothing good comes easy, for Adenuga Jnr, he believes that no amount of pressure can make him run faster than his shadows as people expects him to be far better than his father in all spheres. 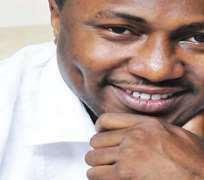 Adenuga Jnr told New Telegraph that he “just try as much possible to put in my best and develop myself. I know it is the mentality of everyone to be more successful than our parents and that is even their prayer also.